Increasingly, companies are becoming differentiated through their BI initiatives. 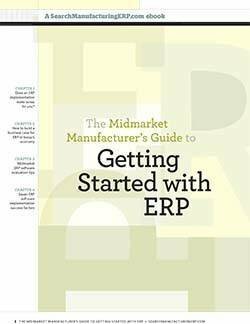 While large manufacturers -- think $1 billion-plus annual revenues -- have the tech dollars to upgrade legacy ERP systems, midmarket companies boast significantly tighter IT budgets. That's bad news for companies trying to turn raw data into meaningful information for business improvements. Still, midmarket buyers have reason to hope for more effective BI -- if they're willing to adjust their expectations. 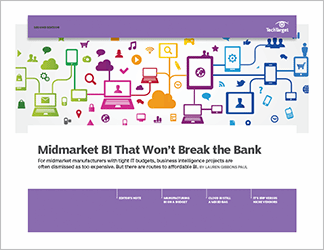 In this three-part guide, learn why manufacturing BI on a budget is increasingly possible for midmarket manufacturers. Written by veteran IT journalist Lauren Gibbons Paul, this guide offers up expert advice on negotiating the path to cost-effective BI. First, she explains why dismissing manufacturing BI as too expensive is a mistake. 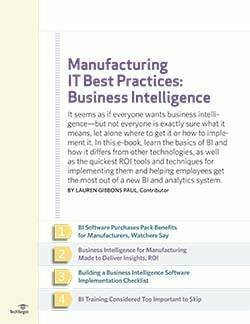 With real-life examples, Paul shows that there are several options -- BI in the cloud being the most popular -- available to companies looking for a more practical manufacturing BI tool. Next, Paul drills down on cloud BI platforms. While increasingly popular among midmarket manufacturers, cloud BI still faces several hurdles to widespread adoption. To close, Paul outlines the big differences between ERP and niche vendors. She writes, "When evaluating business intelligence options, one of the first considerations should be whether a company's ERP vendor can fill the need for BI."